In the previous post we discussed a special type of view file in .NET Core MVC called _ViewStart.cshtml. This file can include a C# Razor code block which is executed before the concrete view files are rendered. The most common usage of the view start file is to declare the layout used for that view. That discussion brought us to layout files and how they can help us factor out common HTML markup from the views. Common HTML markup includes menu items, navigation bars, footers and the like. The content of the concrete view file is injected into the layout file using a method called RenderBody. The RenderSection function adds a named section in the layout that the views can implement with a names section directive. In this post we’ll start covering a new feature in .NET Core MVC called tag helpers. It’s quite a sizable new topic in MVC .NET so we’ll dedicate multiple posts to these helpers since not even experienced ASP.NET MVC developers have been exposed to them. The ‘ui’ and ‘ww’ prefixes denote a tag library which is followed by an element from that library. <j:jelly excapeText="false" xmlns:j="jelly:core" xmlns:st="jelly:stapler" xmlns:d="jelly:define" xmlns:l="/lib/layout"
Jenkins views use the Jelly tag library by Apache. So now .NET Core MVC has also its own tag helper library with its own world of prefixes, conventions and rules. Without proper documentation the .NET Core tags will also look like some voodoo magic just like the above examples. Fortunately Microsoft has provided a good documentation page starting here. We’ll cover most aspects in this series. The type is set to “build” so that the dependency is only provided at during development for IntelliSense. Otherwise we don’t need this package to be deployed to the web servers. Save project.json so that the necessary NuGet packages will be installed. I actually had difficulties in getting IntelliSense on tag helpers to work properly. I started a new .NET Core web application with the “Web Application” template instead of “Empty” like we started this series with to get the JSON markup right in project.json. At the time of writing this post there are higher versions of the installed Razor tools package. The highest version is currently “1.1.0-preview4-final”. However, I tested with packages over the one shown above, i.e. “1.0.0-preview2-final”, but I couldn’t get it to work in the Razor views. Only this specific version worked out fine. If you google “.net core tag helpers not working” then you’ll find all sorts of issues people have encountered with tag helpers. The usual problem is that IntelliSense doesn’t show up at all in the Razor views. There might be some version mismatch between the various libraries declared in project.json but something seems to have been broken after version “1.0.0-preview2-final” of Microsoft.AspNetCore.Razor.Tools. Anyhow, we’ll continue with this older package even though there seem to be more recent ones. This directive with the asterisk means that we want to import all tags from the referenced library. If you have any cshtml files open in Visual Studio then close them all. Save _ViewImports.cshtml and rebuild the solution. So the “asp-action” attribute is not something that will be visible on the client side. All that is translated by the server. If the action method requires a parameter called “whatever” then we’d write asp-route-whatever in the markup. 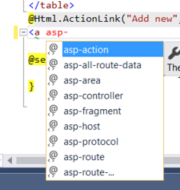 We can put as many of these asp-route- attributes as the action method signature requires. The assignment of asp-route-id “asp-route-id=”@bookViewModel.Id” ” shows that we can mix Razor C# with the tag library. The built-in tag library cannot yet offer all the dynamic HTML building features of Razor and C# so a completely C#-free view file is not yet an option but we might get there sooner or later. We’ll continue to explore the tag library in the next post.